Craig and I are keeping very busy. We rarely have more than a day or two a week when we don't have something scheduled. For some people that may be more than enough down time, but the two of us like our leisure time. 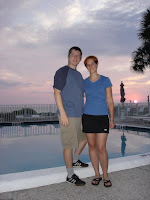 The first couple of pictures here are from our week in Florida, where we did alm ost nothing but relax. We relaxed in the condo we were staying in (many thanks to Craig's Aunt Alyce! 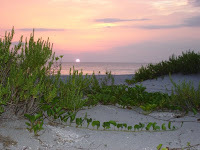 ), we relaxed at the beach, we relaxed at the other beach, we relaxed at the other beach, we relaxed at the pool, at the movie theater, at various restaurants, and so on and so on... it was a great vacation. Plus, we went to Craig's sister Sondra's wedding, which was very nice. We've been back for a month, now, though it doesn't really seem that long. We play in two ultimate frisbee leagues, one in South Bend about 50 minutes away, and one in K alamazoo, MI, about 90 minutes away. We did have costume/dress up night at both leagues a couple of weeks ago, which is always a lot of fun. Craig and I went as superheroes. We don't currently have very good pictures, but some should hopefully be coming before too long. Craig is the guy in the red cape in the picture to the right, and I'm in the blue cape in the picture below. Playing in a cape wasn't as distracting as I though it would be, although Craig did have some problems with his arm getting caught in the cape on some of his longer throws. We also have either one or two day tournaments scheduled for 5 out of the next 7 weekends, which will continue to keep us very busy. But we both enjoy playing, it's great exercise, we meet new peo ple, and it's just a lot of fun. My sister Kristi is staying with us for the next few days, which we're really happy about. We haven't seen nearly enough of her the last three years, since she was living in North Carolina. She graduated this spring with a Master of Fine Arts. She is an incredible artist, with amazing craftsmanship to go with her beautiful aesthetic sense. She specializes in metalworking which incorporates objects from nature. On a different note, we went to see the Simpsons movie last weekend, are going to see the third Bourne movie tomorrow, and I'm planning on watching Stardust next weekend (providing our local theater is showing it. I might have to go to South Bend where there are larger cinemas). I just finished reading the last 4 Series of Unfortunate Events books, the newest Jasper Fforde book, First Among Sequels (featuring Thursday Next), and am starting to read the 7 Harry Potter books straight through. And on another media front, Craig and I have been watching Scrubs and The Office, both of which we really enjoy. We've had really big wasps flying around our house the last month or so - and by really big I mean 2, 2.5 inches long (which might not seem that bad until you look at a ruler and then picture a what looks like a hornet that size flying right at you). Craig did a little research and found out that they are Cicada Killer Wasps. The males don't actually have stingers but like to check out anything that moves, which seems a lot like attacking. The females do have stingers but aren't at all aggressive towards humans (unless they get stepped on or so on). So, while it is good to know that it's highly unlikely we'll get stung, it's still freaky to have monster-sized wasps hanging out by our flowers and in our yard. We're looking forward to a mini Glick reunion next week. It's nice to see family, and very nice to have it just a few blocks away from us instead of in Ohio or other more distant locations. It's great to hear what your watching and reading. Christa and I read the last Potter book together in one shot. That evil procrastinator didn't get us on that one. It would be cool to know if you're listening to anything new.